Coopers Point building – 980 Cooperage Way, Vancouver, BC, V6B 0C3. Coopers Pointe apartments was constructed in 2007 by Concord Pacific and has 85 suites on 15 floors. The Coopers Pointe condo development is on the north false Creek Waterfront next to Coopers Park. BC Place is across the street as is the Edgewater Casino and Plaza of Nations. 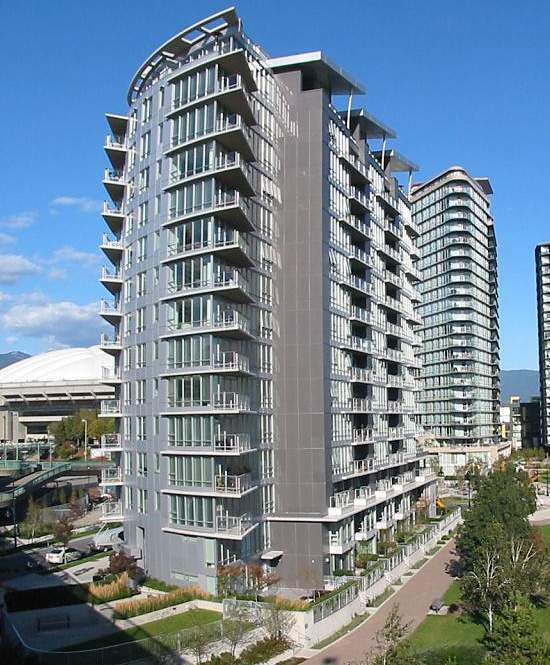 The Yaletown Skytrain station and Roundhouse Community Center are both about 5 minutes walk from Coopers point. All Coopers point apartments have vast windows and great views as its in a waterfront location. The kitchens include granite counters in various color schemes depending on what the original purchaser chose. Stainless steel appliances are standard throughout Coopers point condos and the oven/range is a gas cook top. Washrooms are polished stone with soaker tubs. All suites have a parking space and storage. Coopers Pointe security features include the 24 hour concierge keeping eyes out, coded entry and elevator access, video surveillance systems, secure underground parking and an alarm in each suite if the owners chose to have one.